The Taxpayers' Alliance has long held the view that the inheritance tax should be completely abolished because it is immoral, unfair and unnecessary. It is totally immoral that the state should tax your estate simply because you died, leaving a grieving family to cope with a huge tax bill. It is unfair because often it represents double or even triple-taxation, with the same money having been previously taxed through income tax and stamp duty. Moreover, despite the pain it causes, IHT is totally unnecessary; it raises only £3.6 billion (less than 1% of total tax revenue), whilst the government's own enquiry into waste found over £20 billion wasted and a study by the European Central Bank showed we could save £80 billion if our services were as efficient as those on the continent, so with just a small percentage cut in government waste cut and a small increase in efficiency, we could easily afford to scrap this immoral and unfair tax. Opinion polls have consistently shown that many people instinctively share our view that there is something very wrong with the state making a claim to your assets simply because you passed away, particularly when it has dipped its hands into the same pot once or twice before. This is a view that has only strengthened recently with more and more people being dragged into the inheritance tax-paying band (a 72% increase over the last five years) because of increasing house prices. So it is not surprising that our most recent YouGov poll showed that inheritance tax is the most hated tax. Yet in another sign of how out of touch the political class has become, unfortunately it is not a view shared by the government. While the people are turning against the death tax, the government has just announced that it will be taking steps to squeeze even more money out of grieving families. 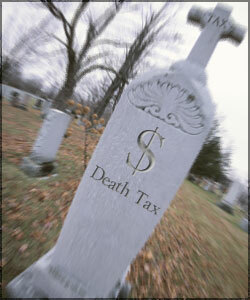 Any gift made 7 years before a person's death may be taxed at 40%. Government officials will now be going to pains to trawl through financial information in an attempt to make sure all of this money is clawed in to feed the government's ravenous spending addiction. It is obvious that this step will make it even more difficult for families to pay their huge inheritance tax bill as gifts given seven years ago are unlikely to be available to pay a sudden, unexpected bill. Government clearly cares very little for the bereaved families who are hit with huge tax bills simply because one of their relatives has had the misfortune of dying. Government is far more concerned with securing its spending fix at any cost. The only hope is that this will further strengthen the public's righteous anger and so bring about the death of the death tax much sooner.